In 2015, we opened the Catbird Wedding Annex — a calm and relaxing space devoted solely to our wedding and engagement collection. We’d been in business since 2004, and over that time our neighborhood had changed — and we changed with it. What began as a tiny little accidental pocket of our business (wedding and engagement rings) grew into a thriving, dynamic part of Catbird. Our flagship store at 219 Bedford is extremely tiny, and gets very busy, so we jumped at the chance to turn an even smaller storefront into our Wedding Annex, and then jumped even higher when we outgrew that space! At the Annex, you can browse our full collection of engagement rings and bands, try on favorites, take photos, and receive a detailed summary of what happened during your visit. The Wedding Annex is now located at 103 Metropolitan Avenue. Its pressed tin walls and ceilings and old mercantile-style storefront so encapsulates the Williamsburg we love. Times have changed in our neighborhood, but a rolling stone gathers no moss, and there’s magic everywhere if you’re inclined to seek it. We painted the walls white, hung our favorite globe lights, moved our beloved office fig tree with a black ribbon bow-tie around its trunk into the front window, rolled Rony’s grandmother’s rug under the swan chairs we’d long been coveting, and opened up shop, again. Our Wedding Annex is now big enough to welcome all of the people in love who ring our doorbell. And what’s better than being able to receive your visitors with arms wide open? If you live in or near New York City, or if you’re visiting, we encourage you to book an Annex consultation. Even if you’re just curious! You’ll get one-on-one, in-person care from Catbird wedding experts, just a few blocks from our store - both locations are in the heart of Williamsburg, Brooklyn. At the Annex you’ll have the opportunity to browse our full collection of engagement rings and bands, try on favorites, take photos, and receive a follow-up email from the concierge team with a detailed summary of what happened during your completely no-pressure visit. We make it a point to show everyone who comes to visit that there really are no rules when it comes to wedding rings. The most important thing we want you to take away from your experience at the Wedding Annex is that the process of choosing a wedding ring is all about you - we’re just here to help make your decision easier. We do not work on commission and are happy to help you work through any questions you may have — even if that means you don’t purchase anything. We’re here to help you figure out what kind of rings you like and/or what could work well with what you already have (whether it’s a vintage piece or something purchased elsewhere). The process of choosing a wedding is all about you (we’re just here to make your decision easier). We make it a point to show everyone who comes to visit that there really are no rules when it comes to wedding rings. Don’t worry about the space between your engagement ring and band (we can show you many options where negative space looks wonderful), don’t stress if your engagement ring and band don’t match perfectly because it’s more important to love them individually, and always keep in mind that what you may love today may not be what appeals to you in ten years. We help you take these points (and more) into consideration through every step of your experience so you select a ring that brings you joy for lifetimes to come. You’re encouraged to try on rings and take as many pictures as you want. The Annex isn’t a “look but don’t touch” experience. We want you to touch, feel, and take as many photos as you want. We understand that advice and input from loved ones can be so helpful in gaining decision-making confidence! If you’re confused about which ring size is right, the Annex is the best place to go. There are so many things to consider when choosing a wedding ring - an important but often forgotten (and less exciting) one is ring size. Sizing is a very personal preference and not at all an exact science. Some people like to wear their rings a bit looser, while others like their rings to fit more snugly. During an Annex consultation, we can provide you with the tools and advice to help you reach your sizing decision. You can try on ring sizers that have been specially made by our in-house jewelry studio, letting you find your precise size in Catbird rings. And when it comes to rings we offer made by other designers, sizes may vary slightly vary, so trying on in person is great when possible; sizing can really depend on the style and width of the ring. You can try on as many different sizes and styles as you want to find the one that feels best — we’re happy to give tips and offer suggestions based on our years of experience. If you have questions or concerns we can make sure that you are looking at rings that work well with your lifestyle. We can discuss if the rings you’re interested in are able to be resized or, if you are veering towards rings that are not able to be resized, what that might mean for you. We know that every situation is unique and we’re here to help guide you. Planning a surprise proposal? Sometimes you need a behind-the-scenes, stealthy teammate. Mastering an old-fashioned, pop-the-question, surprise proposal can be hard but the result can be exciting and fun. We have a stockpile of bodega-style “Thank You” bags on hand for you to slyly hide your purchase. We’ve wrapped up a ring box in brown tissue paper so our customer could tell his curious future fiancé that there was “just a breakfast sandwich” in his bag. The wedding experts will ask you questions you never knew you needed to figure out before you buy a wedding ring. Whether you just have no idea as to what kind of wedding rings you would like or if you already have picked out your styles and designs and just need help narrowing down your choices, there are probably some questions you never even knew you should consider when thinking about investing in a lifelong ring. Does this style/stone work with how you live your life? Are you the kind of person who never takes their jewelry off? What does that mean for the kind of ring that would suit you best? What are care tips and things to avoid depending on what ring you've chosen? There are lots of details that need to be considered when going through your choices, — during your consultation you’ll get to the bottom of everything for a more confident purchase. I must have gone in person to peek at the Swans more than five times, and not a single time did I feel like I was imposing or asking too many questions. Ring shopping can be super overwhelming but they made it comfortable and reassuring. We'll note all your favorites, and offer the option of being followed up with our concierge, plus you’ll go home with a small gift from us! Choosing a wedding ring is a serious decision, and during your visit we'll cover a lot of ground, from styles to metals to prices. Don’t worry about trying to remember all of it! We’ll take notes throughout the meeting so you can reference them when you get home and digest everything. 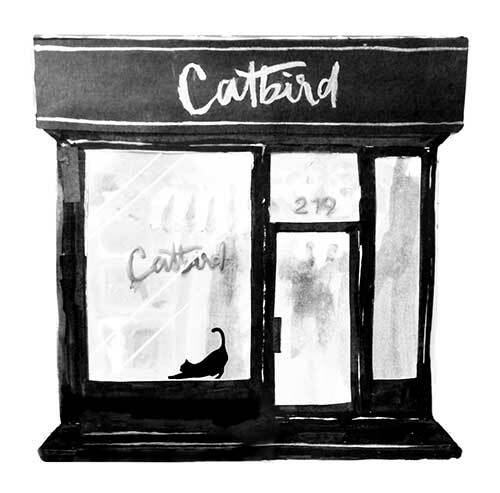 And as a token of well wishes, every person who books an appointment at the Wedding Annex goes home with a complimentary Catbird tote as a thank you. You’ll get a follow-up email from Catbird’s concierge team with all the details to complete your experience or answer any follow-up questions. Within two to three business days after your visit, you’ll receive an email from the Catbird concierge team with an overview of your visit, answers to any of the outstanding questions you had, and easy guidance for whenever you’re ready. Visiting the Annex gives you the chance to explore our treasured neighborhood, Williamsburg. Catbird was established in 2004, in Williamsburg. It’s the neighborhood where we grew Catbird from a teeny tiny little store, to a teeny tiny little store with a Wedding Annex, a Welding Annex, a jewelry studio, a big beautiful website, and a nearly 100 person team. Lots of us also live here! When you come to visit the Wedding Annex, we hope you’ll get to carve out a little bit of time to prowl around our neighborhood. Visiting the Annex gives you the chance to explore one of the more dynamic and creative neighborhoods in New York City. Our old neighbors have a beautiful new gelateria called Gentile where you will want to eat everything. The new Domino Park is an example of civic government (and New York) at its finest — a glorious stretch of waterfront open to one and all. Bakeri makes bite-sized raspberry lavender bars that are perfect for snacking on with a coffee, and there’s never a bad time for a bagel, a black and white cookie, and to visit some bodegas while you’re here if you don’t live in New York. Small wonderful things, all! We made a guide to our neighborhood favorites (you’ll also find to-go copies of this at our Wedding Annex). Things change quickly around Williamsburg, but so long as there are roses in the community gardens, and fig trees growing in the (often secret) backyards, you’ll find us right here.